So, I’ve been wanting to get back to playing with C# for a while, and finally have had the opportunity. I’ve also been wanting to play with the Task library in .NET and see if I could get it to do something interesting, well below is the result. 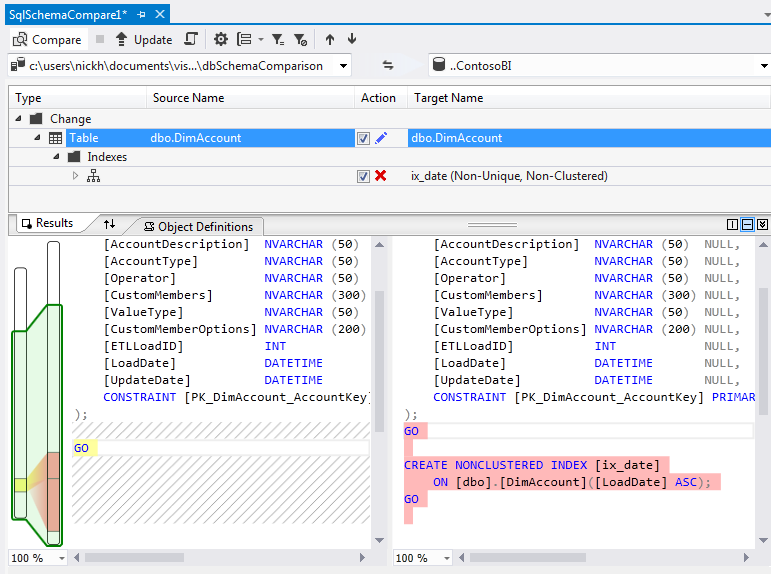 The code below, running in a .NET 4 project, will run two SQL SELECT statements against the AdventureWorks2012 database. 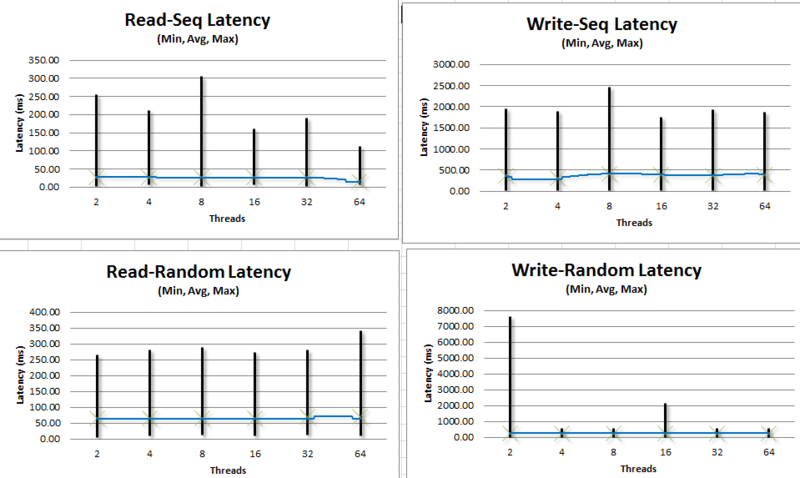 There are three tasks in here, ParallelTask 1 and 2, and a timing task. The Parallel task takes a Connection String and a query as inputs, and passes out a Status Message. One of the important points with a task is that the task has to be self contained. This is why the connection is instantiated within the task. I also added in a Timing task (ParallelTiming) so I could pass out a ping message. The whole thing is controlled by the code in the main section, which is used to start the three tasks, with their appropriate parameters. After this it awaits the tasks completing, then passes out the resulting return messages. Try it out; it’s good fun and all you need is SQL Server, AdventureWorks and something to build C# projects. 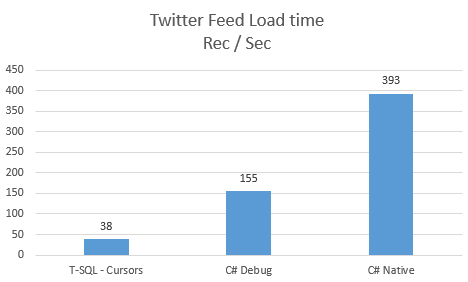 Having found an interesting post on loading multiple CSV files in T-SQL , I’ve updated it to load the files in. First though, we need to create a table to take the data. 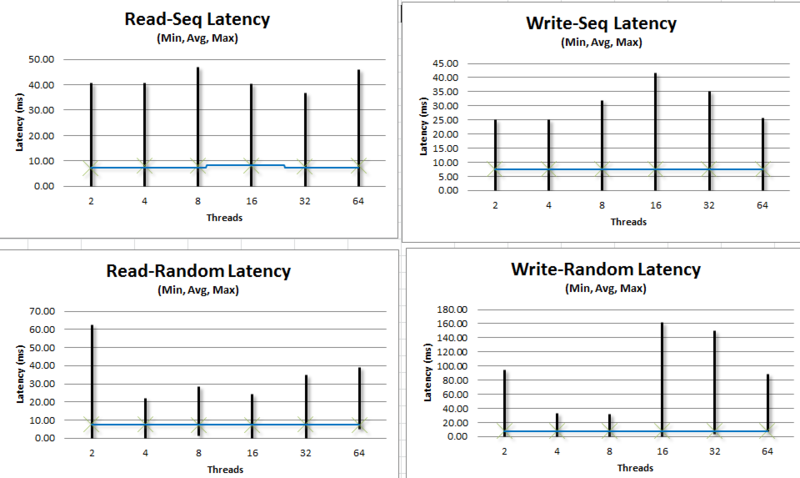 Note that I Page compressed the table as I wanted to reduce the space it took up. It went down from 3GB to around 1.5GB. Once loaded, I had 15,668,549 rows of data, sitting in a 1.2GB database. Then, by playing with PowerPivot you can create ‘fun’ visualisations like this. Have fun, and as they say on Crimewatch, “don’t have nightmares, do sleep well”. It’s a bit last minute, as I stepped in to help Adam out, so bear with me. As always, thanks to Adam for starting this off, I’ve posted a few articles on previous runs, and have found other people’s posts to be really interesting. I hope this follows in the same way. So, what I’d like to know is, what is your most horrifying discovery from your work with SQL Server? We all like to read stories of other people’s misfortunes and, in some ways they help to make us better people by learning from them. Hopefully, there is nothing as bad as Charlton Heston’s discovery, but there may be in its own way. Soylent Brown – You did a post, Great Job!! Soylent Orange – You did a post, it made me wince! 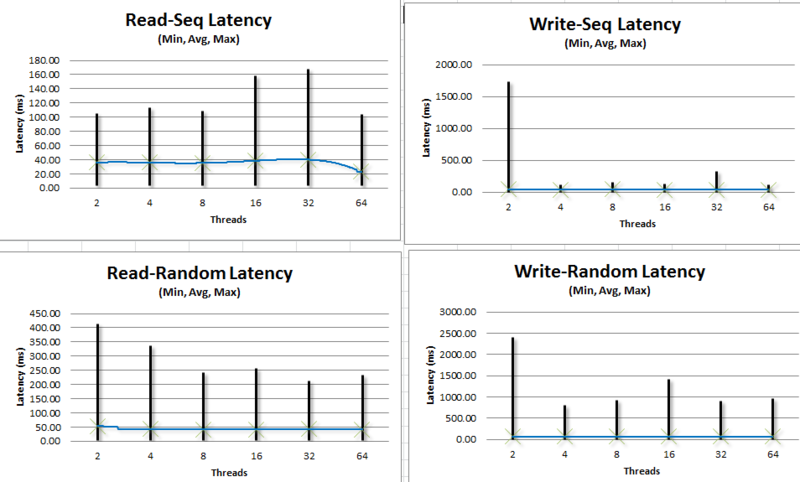 Soylent Green – You did a post, it made me wince, and it included some T-SQL. Do you have the words straight? Your blog post must be published between Tuesday, October 9th 2012 00:00:00 GMT and Wednesday, October 10th 2012 00:00:00 GMT. 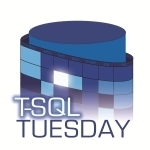 Include the T-SQL Tuesday logo (above) and hyperlink it back to this post. If you are on Twitter please tweet your blog using the #TSQL2sDay hashtag. I can be contacted there as @nhaslam, in case you have questions or problems with comments/trackback. Thank you all for participating, and special thanks to Adam Machanic (b|t) for all his help and for continuing this series! Thanks for posting, and I’ll have a follow-up post listing all the contributions as soon as I can. T-SQL Tuesday #34: Help! I Need Somebody! It’s another TSQL2sday post, this time hosted by Rob Volk (b | t ). Thanks for hosting Rob. So, many years ago, when I started out with SQL Server, back in the heady days of 6.5, there was much less of a SQL Community, actually, I don’t even remember one. The only way I could get help, was either through using MSDN, or by emailed colleagues I met on a SQL training course. I never needed anybody’s help in any way. Though that’s primarily due to stopping using SQL for a while, just a year or so, but still. Everyone needs help, at some point, with something. It’s not a weakness, it’s a strength. But now these days are gone, I’m not so self assured. In the past few years, I’ve started working more and more with SQL, and found that it is such a huge product that no one can know the whole thing (SSAS, SSIS, SSRS included), and because of that, I’ve found several ways to get help if I need it. Though, before I get into that, I need to say something about the community. There is a huge SQL Community out there, though the first community event I attended wasn’t a SQL One. It was a Developer event, Remix Uk, back in 2008 (http://www.microsoft.com/uk/remix08/default.aspx). It was a great event and I got to meet some great people there, including Scott Guthrie! Getting to this event was pretty much solely due to an ex-colleague, Jes Kirkup. Thanks Jes! Since then I’ve started attending community events where I can, including the local DevEvening events (where I’ve done a couple of short presentations), and SQL community events (SQLMaidenhead, SQL in the Evening, and SQLBits of course!). I’ve found that these are a great way of getting a great insight into what skills others in the industry have, and so where I should be targeting my learning. Following on from that, I’ve met some great people, and there are people who I know I could ask for help if I needed to. Not to mention the #SQLHelp hash tag on twitter, where there is help, pretty much 24hours a day, the only restriction being the need to phrase your question in 150 characters (160-hash tag). Now I find I’ve changed my mind and opened up the doors. Now I find that I am helping people where I get the opportunity, am publishing blog articles (here, like this one!) and am hoping to do more Community presentations. Furthermore, I’m doing internal training courses (next month I’m doing one on SSAS), and have recently started mentoring a colleague in SQL. It’s great to be able to share knowledge and experience. Thanks for listening, and reading, and thanks again to Rob for hosting. 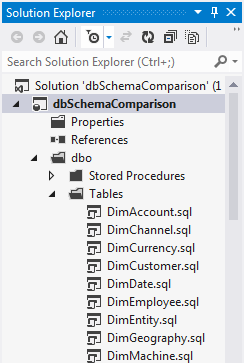 Having recently been playing with the newly released Visual Studio 2012, one of the really nice features that I’ve seen is the Database Schema Comparison functionality. If you’d like to follow along with this, you’ll need the ContosoBI database, which is available here. 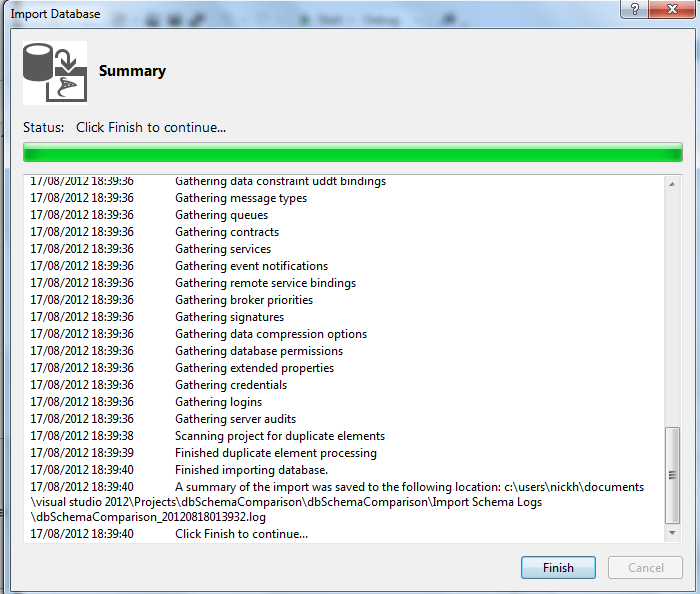 This can be seen by launching VS2012, choosing New Project, and selecting the SQL Server Database Project. Don’t forget to give the Project a name, I called mine dbSchemaComparison. When the Solution has been created, you’ll be presented with the Solution explorer. 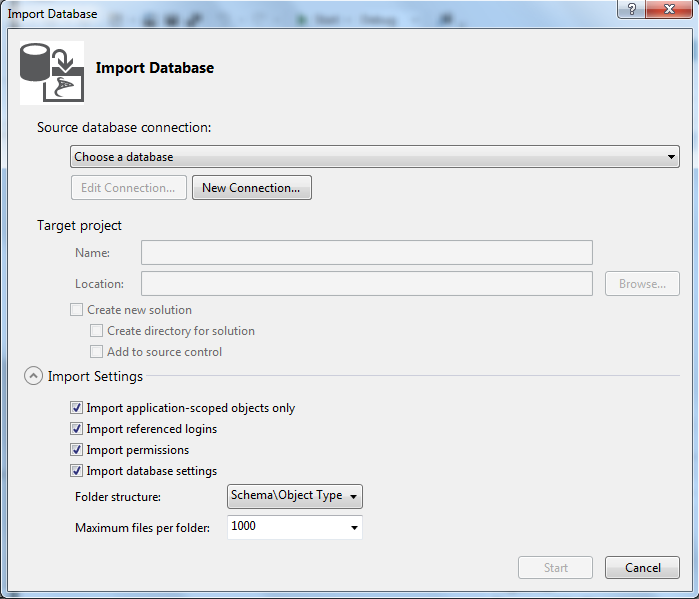 In here, you’ll want to right-click on the Project name, and choose Import > Database. In here, you’ll need to create a new connection to your database. Also, if you are wanting to track everything, you need to check the Permissions and Database Settings tick boxes. Then click Start. While the process is running, you’ll be presented with a dialog box showing the progress. When it’s completed, click Finish. 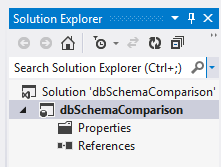 Now, when you look in the Solution Explorer, you’ll see a set of SQL Scripts that have been created to match the structure in the database. 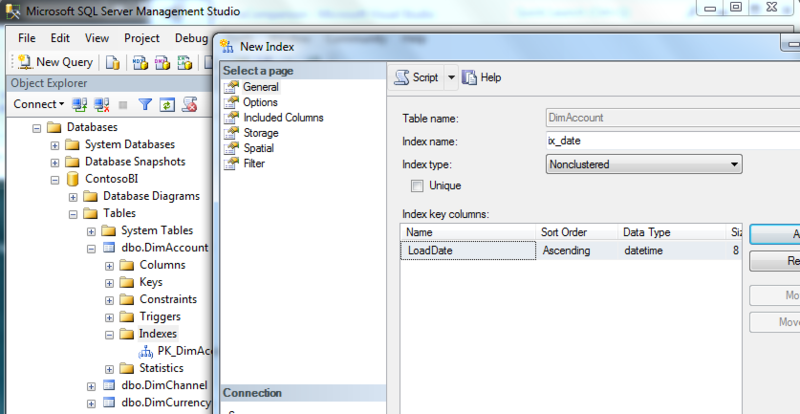 My next step was to connect to the database using SQL Server Management Studio, and alter one of the tables. I decided to add an Index to the DimAccount table. The index was called ix_date, and I added the LoadDate field from the DimAccount table to it. 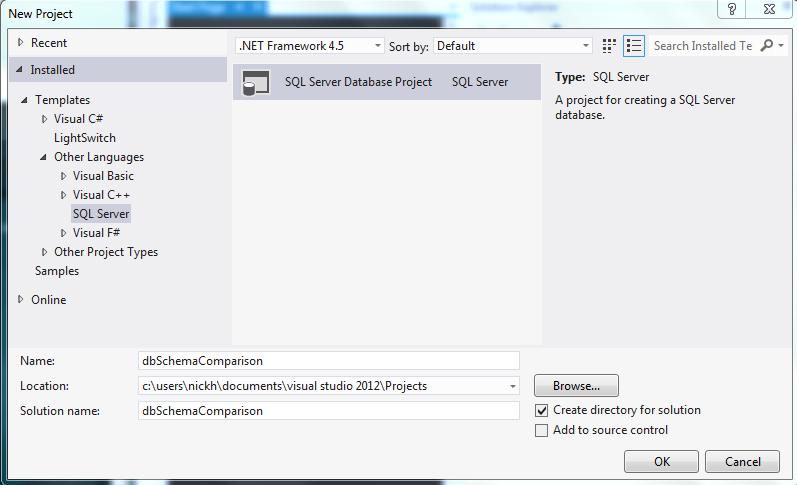 The final step in this process is to go back into Visual Studio, right click on the Project and choose Schema Compare. When this window opens, you have two drop down boxes. The left contains the Project that you have in VS2012; the right will need to be populated with a database for comparison. When you’ve populated the database on the right, click the Compare button. The Schemas from the two projects are loaded and compared. The results are then displayed on the screen. As can be seen below, it’s pretty obvious what the differences between the environments are. If you then want to sync the environments, you need to remember that you need to move the changes from Source (Left) to Target (Right). If you want to remove them from the Right (database), then you can click Update (or the script button next to it, to generate a script). Alternatively, if you want to update your project, you can click the ‘switch’ button between the two projects and rerun the Compare. A really nice feature, I think you’ll agree. 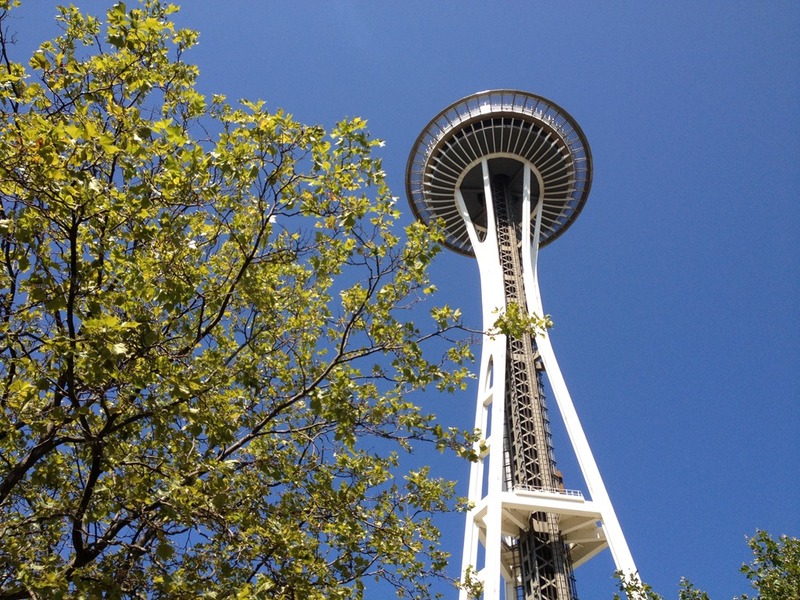 Over the past week, I’ve been attending the IE2 Course, held by SQLSkills, in Bellevue (near Seattle). It’s been a really intense week, covering a lot of really deep technical stuff. However, I’m not going to talk about that. 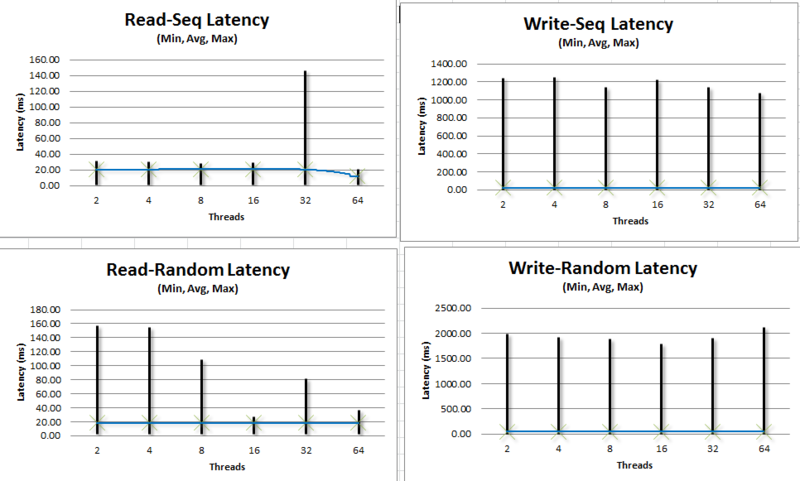 The benefits of training by some of the leading SQL Server people in the world should be obvious. Also, my poor brain needs time to assimilate everything that’s been hosed into it. It has, however, been a great honour to spend time with the great people on this course, and I mean the other attendees (such as Kendra Little, Jes Borland, Tim Ford and Dan Taylor among others) as well as the Instructors (Paul Randal, Kimberly Tripp, Jonathan Kehayias and Joe Sack). Adventure Works Workload Generator – Jon Kehayias has a SQL workload generator. It was a hard flight over here, 9.5 hours, on a plane that was an hour late departing, but I had the SQL Internals book to keep me occupied (between films, Marvel The Avengers, and The Hunger Games…). I’d like to thank my employers, TAH Ltd (twitter|web), for sending me on the course, I hope that the benefits of this training, will continue to be obvious for many moons. More importantly, I’d like to thank my wife, Emma, since without her support, I’d never have had the confidence to travel 4500 miles for a training course. Thank you, to everyone on the course, for making it a great learning experience. ps. Sleeplessness, since the majority of the week here, I woke up at 3am, almost every day, for no apparent reason.